It highlights our good service to the customer and our preparation in new technologies always in avant-garde and constant training. Fearless Photographers– We belong to this exclusive group of Photographers worldwide where are the best photographers of the Wedding of the World. FEPFI – Members of the Spanish Federation of Photographic and Image Professionals. FEP – Members of European Professional Photographers. 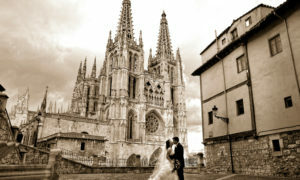 We have more than 15 years leading the sector of photography in Burgos, backed by thousands of satisfied customers throughout all this time. We work with the best companies in Burgos, giving them a service of photography for advertising and catalog, as well as the coverage of events and congresses in Burgos and in all Spain. Likewise we are photographers preferred for thousands of families in their family events of all kinds. We are delighted to be part of the best moments of the life of the people. We are photographers and we love photography, we have a classic and artistic style that we try to translate our portraits and shoots.